MomMomOnTheGo made a recent addition to her kitchen to help with organization. The item I added was the Diamond Tab Dry Erase Magnetic Whiteboard. Modern designs provided by the company meet top quality standards and assure acceptance of high requirement specifications. Materials used for manufacturing the product meet high sophisticated standards. Dry Erase Magnetic Whiteboard made by DiamondTab values the best fit to the most recent kitchen and interior designs. Additional focus is also made on strong magnetic strips and high adhesive pads, the best available on market, to assure perfect placement of the item. “The icing on the cake” are specially designed diamond-shape magnets provided with the board. Product exclusively available on Amazon. I love my DiamondTab dry erase, magnetic, whiteboard. It wipes clean very well which is important to me. I hate it when I have residue from previous notes left on my whiteboard because it does not wipe completely clean. The magnetic strength in the whiteboard itself is good for holding things onto the board. I love the two blue diamond magnets my board came with along with the two green circle magnets. Of course the magnetic dry erase marker is also very handy to have right there. The board comes with either adhesive magnets or adhesive squares for you to secure your Diamond Tab dry erase, magnetic, whiteboard to the surface of your choice. I used the adhesive magnets and they hold my Diamond Tab perfectly to the side of our fridge. The Diamond Tab is 11 inches by 14 inches so it fits perfectly on the side of our fridge. We find the Diamond Tab we have very useful on the side of our fridge. We just had a double birthday party in our house and we made notes on dinner preparation and timing on our Diamond Tab. Our Diamond Tab is great for notes you need to leave, reminders, or whatever else you may need to jot down to keep yourself and family organized. 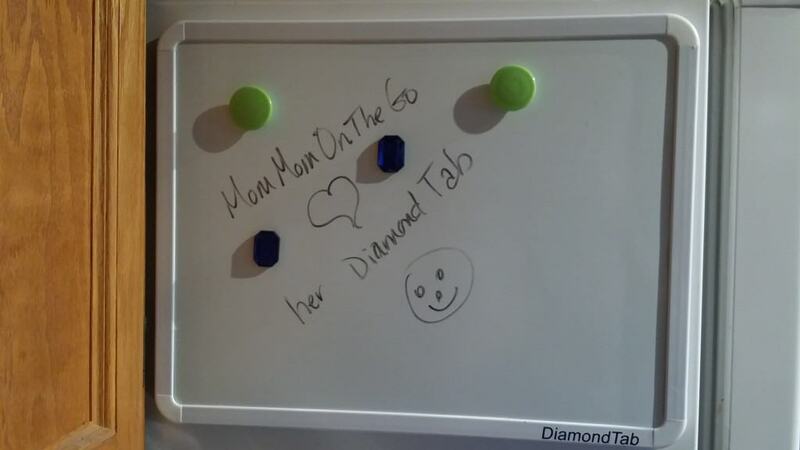 The Diamond Tab dry erase, magnetic, whiteboard is perfect for the kitchen, office, room, or just about anywhere else you might need to jot something down. If you are thinking about exploring the Diamond Tab, make sure you sign up for their newsletter as the Diamond Tab website says that you save up to 50% off when joining the Diamond Tab Club. You will find the sign up part way down the home page of the Diamond Tab website.